Speaking of Steve Belcher, he brought me a bar of Socratic soap, "The Soap of the Greek Gods," that he picked up on a recent trip to Chicago. Amicus Socrates, sed maior "soap." So, we started this new "tradition" at our Deacons meetings this month of reading through the Pastoral epistles (which is a great idea--thanks Chris Marshall for the suggestion!). We started reading in 1 Timothy going around the circle with everyone taking a couple of verses in turn. Everyone had the JPBC authorized version (the NKJV) except Steve Belcher. When we got to chapter 1, verse 6, Steve providentially read: "From which [faith] some having swerved have turned aside unto vain jangling." "I don't mean to swerve into vain jangling but shouldn't we consider...."
"I don't want to be a vain jangler but ...."
"At the risk of vain jangling, might I suggest ...."
"Is the opposite of vain jangling, jain vangling?" That got me thinking of other notable KJV phrasings. Anyone want to share a favorite? This Sunday, Lord willing, I will preach from Judges chapter 21 the 22nd and last message in our series on the book of Judges that started back in September 2006. The audio files for the series are here. 1. Dan Block's Judges, Ruth volume in the New American Commentary Series (Broadman & Holman, 1999) has provided cutting edge Old Testament scholarship and theological insights from an evangelical perspective. Block wrote this while at SBTS but now teaches at Wheaton. 2. Andrew R. Fausset's Judges volume in the Geneva Commentary Series (Banner of Truth, 1999; reprint of 1885 original) provided creative exegesis and exposition from a traditional, Reformed theological outlook. Fausset (1821-1910) was an esteemed Irish churchman. 3. Dale Ralph Davis' Judges: Such a Great Salvation (Christian Focus, 2000; reprint of 1990 orginal) is a popular-format work that provided wit, sharp homiletical insights, and insightful practical application. Davis is a former OT Professor at Reformed Theological Seminary (Jackson, Mississippi) and now a Presbyterian Pastor. As I have preached through Judges on Sunday mornings and Leviticus (we're still in chapter 19 at this point!) on Sunday evening, we have definitely been immersed in the Old Testament. To quote JPBC's Mr. Rudulph: "I hear that Chris Marshall is the one responsible for his preaching in the Old Testament!" Some have suggested a name change to "Jefferson Park Baptist Synagogue." Another asked why we never see a "Law Baptist Church" or a "Torah Baptist Church," while "Grace Baptist Church"es abound. When Judges is complete, however, we will return to a New Testament book on Sunday mornings. That’s right, I recently read the children’s book Heidi. I am very secure in my masculinity! I kept seeing it on bookstore shelves among classic children’s literature and wanted to find out what it was about. Johanna Spyri (1827-1901) was born in the village of Herzel, Switzerland, near Zurich. Her husband, Bernhard Spyri, served as the town clerk of Zurich. She was the mother of one son, also named Bernhard, who suffered from poor health, much like the character Klara in Heidi. Mrs. Spyri began to write stories in her home. Heidi, the first of her longer stories, was published in 1880. The book is about an orphan girl, Heidi, who goes to live in the remote Swiss Alps with her gruff, cantankerous grandfather. She also goes for a time to live in Frankfurt with a wealthy household to be a companion to a sick child, Klara. By kindness and pluck, Heidi is able to win the hearts of the adults and children who come into contact with her. Heidi finally returns to live with her beloved grandfather on "the Alm." When Klara comes for a long visit she is miraculously restored to health from salubrious country living. As I read the book I was struck by its overt religious and spiritual themes. Aside from obvious messages, like the duty to be kind to orphans and widows and the importance of family, one might say that the major theme of the book is the Providence of God. "Come, my child," she said, "I want to tell you something. When we have a sorrow we cannot speak to anybody about, then we tell the dear God in heaven, and ask Him to help us, for He can take away every sorrow that troubles us. You understand that, don’t you? You pray every night to the dear God in heaven, and thank Him for everything good, and ask Him to keep you from all harm, don’t you?" "Oh no, I never do that!" answered the child. "Have you never prayed, then, Heidi? Do you not know what it is?" "…You see, Heidi, the reason you are so sad is because you know no one that can help you. Just think what a good thing it is, when something troubles and distresses you in your heart, that you can go any moment to the dear Lord and tell Him everything, and ask Him to help you, when no one else can help you! And He can always help you and make you happy again" (p. 114). Klara’s kind grandmother teaches Heidi to read using a story book version of "The Prodigal Son." When Heidi returns to her rough grandfather she reads him the story, exuding, "Isn’t that a beautiful story, grandfather?" That night, after Heidi is tucked away to sleep, the grandfather bows his head and prays with tears rolling down his cheeks, "Father, I have sinned against heaven, and before Thee, and am no more worthy to be called Thy son!" (p. 165). The people of the village are shocked the next Sunday when the notoriously anti-social "Alm-uncle" and his little granddaughter attend worship at the local church. When Heidi notes a change in his appearance, the grandfather replies, "Well, you see, Heidi, I feel happy because I am on good terms with people and at peace with God and man; that does one good! The dear Lord was good to me when He sent you up on the Alm" (p. 169). Heidi strikes up a friendship with a doctor from Frankfurt who is grieving the death of his only child. When he asks the child what one should do with his sorrow, Heidi replies, "He must tell everything to the dear Lord, if he does not know what to do." The Doctor responds, "But if what makes you very sad comes from Him, what can you say to the dear Lord?" The precocious theologue answers: "Then you must wait, she said after a while with assurance, "and keep thinking: ‘Surely now the dear Lord knows some joy which is to come out of this by and by, so I must be still for a little and not run away from Him.’ Then all at once it will happen so that you will see quite clearly that the dear Lord had nothing but good in His mind all the time; but because you could not see it so at first, and only had the terrible sorrow all the time before you, you thought it would always remain so" (p. 195). Later, when Heidi and Klara look at the twinkling stars, Heidi observes they shine, "Because they see up in heaven how well the dear Lord directs everything for people, so that they need have no worry and can be safe, because everything will happen for the best…. But you know Klara, we must not forget our prayers; we must ask the dear Lord to think of us, when He is directing everything so well, that we may always be safe and never afraid of anything" (p. 242). My guess is that Heidi’s popularity has slipped in recent years for the very reason that it is so "Christian" in its outlook. Sadly, many in our jaded culture would also likely see its hopeful message as hokey or naïve. Maybe that’s all the more reason to promote its reading to our children. You can even read it online in English or German. Last night at Body Life we were studying the book of Job. I was struck by Job's complaint about violence on the earth in Job 24. Job 24:12 The dying groan in the city, And the souls of the wounded cry out; Yet God does not charge them with wrong. 13 There are those who rebel against the light; They do not know its ways Nor abide in its paths. 14 The murderer rises with the light; He kills the poor and needy; And in the night he is like a thief. Job 24:22 But God draws the mighty away with His power; He rises up, but no man is sure of life. 23 He gives them security, and they rely on it; Yet His eyes are on their ways. Job 24:25: Now if it is not so, who will prove me a liar, And make my speech worth nothing. I watched part of the convocation at Virginia Tech from Tuesday (April 17) and found much of it to be very spiritually curious (see the video here). How do you have a service of mourning with no clear commitment to belief in any particular religion or view of God? The painfully politically correct service was hard to watch. Here are some reflections. Most disconcerting was the segment when four leaders from the religious community" were asked to speak. They were Dr. Riyad (sic? ), a leader of "the local Muslim community," Julie Still (sic? ), from the Living Buddhist group at Va Tech, Sue Kurtz (sic? ), from the Hillel Society, and Bill King, the Lutheran campus minister. The Muslim read from the Koran in Arabic; the Buddhist quoted the Dalai Lama; the Rabbi read from Ecclesiastes 3 in Hebrew; but the mainline Lutheran minister never mentioned the name of Jesus, though he did make an out of context quote from the gospel of John ("The Light shines in darkness but the darkness does not comprehend it"-John 1:5) without any reference to its location in the New Testament (contrast the pains taken by the imam to locate his Koran quotations) or its true Christological meaning. The words from these leaders (except the Mulsim and the Rabbi, to some degree) were blandly humanistic. The Buddhist informed us that "the message of all religious teachings is the sacredness and value of human life." She also noted that ‘we are born into this world with an inherent good nature" and "we must restore our faith in humanity." The mainline Lutheran told the audience that one of their purposes for coming together was to "drink deeply from religious streams." Note the plural. The "all is one" spiritual philosophy was the only view on display. He also affirmed what he called "the sovereignty of life over death" but said nothing of the sovereignty of the God of the Bible. On one hand, one might say that the representation of various religions was appropriate (the victims did include those from diverse religious backgrounds). On the other hand, it seems odd that no evangelical Christian Minister or Pastors of local Christian congregations (the Lutheran is a campus minister) were on stage (perhaps some were invited and declined to be part of the "interfaith" experience). Also, the choice of representatives supposedly from the "local" religious community was so obviously and cloyingly politically correct. Once wonders, in reality, how many practicing Buddhist are really in Blacksburg or Montgomery County, Virginia? Check out the religious stats for Virginia, Roanoke, and Montgomery County. The largest group (evangelical Protestants) and even Catholics were not included at the Convocation podium. The few overt Christian aspects of the convocation included the instrumental version of "Amazing Grace" and the unison recitation of the Lord’s Prayer. The Convocation ended with a poem by Va Tech Professor, Nikki Giovanni. This was one of the most surreal aspects of this convocation. First, this "Black Panther" poetess came to the podium dressed as a man with a dark androgynous suit, white shirt and black tie. 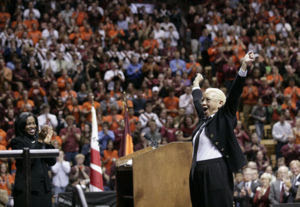 Her poem, "We are Virginia Tech" was presented in the oratorical style of a black preacher. She shouted, "We did nothing to deserve it" (contrast Jesus’ reaction to unexpected evil in Luke 13:1-5 and his challenge: "But unless you repent you too shall perish."). She encouraged, "We are better than we think." And she compared the human losses at Va Tech with a baby elephant losing its family to ivory poachers! Wasn’t the whole point of the convocation to decry the devaluing of human life? When no preachers of the gospel are allowed to speak, I guess a woman poet dressed up as a man is the best a secular world can offer. The convocation also reflected the secular university’s undying confidence in "counseling." A senior administrator encouraged students to go where they could get the best hugs. When you do not have the body of Christ, I suppose counseling and hugs are the best you can do. The convocation was a fascinating look into what human-centered spiritual life looks like without all the encumbrance and strictures of the God of the Bible. As Jeremiah lamented in his day, "They have healed the hurt of My people slightly, saying ‘Peace, peace!’ when there is no peace." How do we find real peace? See Romans 5:1: "Therefore, having been justified by faith, we have peace with God through our Lord Jesus Christ." The news of what is being called "the massacre at Virginia Tech" last Monday has sent shock waves through the nation. Here in Charlottesville, it seems we are hit especially hard by the news. We live in a college town much like Blacksburg and our UVA alumni enjoy a good natured and spirited rivalry with Virginia Tech. This event did not happen a world away or across the country, but right here in our Commonwealth. News of the senseless killings at Tech made us consider that the victims were likely people much like those who are members and attendees of our college town church: university students, faculty, staff, and community members. As someone said, "This week we are all Hokies." You can be sure that there are Christians who are involved in serious ministry in Blacksburg this week. There are churches, campus ministries, and individual believers who will be comforting the victims, their family members and loved ones. They will also be sharing Christ. Let’s join in lifting up our fellow believers this week as they minister in these trying circumstances. We will devote time in our 10:45 am worship service this Sunday to lift up the Virginia Tech and Blacksburg community. As I have reflected on this event, I was reminded of the passage we read in worship last Sunday from Judges 19. That chapter describes an outrageous situation in Israel when an innocent woman, the Levite’s concubine, was killed by lawless men. When news spreads of this travesty, the author of Judges describes the reaction of Israel as they exclaim: "No such deed has been done or seen from the day that the children of Israel came up from the land of Egypt until this day" (v. 30). Every once in a while, even in a morally jaded and spiritually insensitive culture, some things happen that are so reprehensible in their ungodliness that they evoke outrage. Events like these remind us of the unpleasant reality of sin and evil. At the close of Judges 19, the scriptural author intones: "Consider it, confer, and speak up!" (v. 30). Let us take his counsel to heart as we reflect on the sad events of this week at Virginia Tech. This fine collection of humanity from Jefferson Park will be heading to Bicske, Hungary in July to minister alongside the members of Bicske Baptist Church. This photo was taken after Lord's Day worship this morning as we met to pray and make preparations for our journey. Ecclesiastes 3:11 says that God has placed eternity in the hearts of men. Men are caught between two realities: (1) the knowledge that we will one day die—our mortality; and (2) a sense that there will be the reality of an existence beyond our death—our immortality. Men through the ages have expressed a desire to prepare for existence beyond death. The Pharaohs of ancient Egypt built immense pyramids to hold their mummified bodies and filled their death chambers with furniture, clothing, food, tools, and even slaves to serve them in the life to come. In 1974 in Xian, China the tomb of the first Chinese Emperor was discovered. Shi-Huang-ti went to that tomb in 210 B. C. after an eleven year reign as Emperor. Over 700 convicts had dug out the massive tomb and it was filled with 7,000 life-sized clay pottery soldiers and horses. Not a single soldier’s face was alike. After his burial, the tomb was covered with earth, trees were planted above ground, and the tomb’s architects were executed. There it lay till 1974! However misguided, this man made some massive preparations for the after-life. The question we ask in this graveyard this morning is what preparations have been made for your life beyond this life. The key to understanding God’s plan for our future lives is unlocked in 1 Corinthians 15. I. Paul wants to be clear about the Gospel (vv. 1-8). Paul declares the gospel in which his hearers stand (v. 1). The evidence that they are saved is that they hold fast the word Paul preached to them (v. 2). This is the good deposit, the faithful tradition, that must be preserved for each generation. 1. Christ died for our sins according according to the Scriptures (v. 3). Christ’s death was substitutionary (in our place) and penal (he bore God’s wrath). This was week there was a stir in the United Kingdom when a liberal Anglican clergyman, Jeffrey John, announced in a BBC commentary that this traditional view of the cross makes God a "psycho-path"; he called it "repulsive" and "insane." But let God be true and every man a liar. Christ died for us. 2. He was buried (v. 4a). He did not just appear to die. He really died. He expired. The breathe of life left him. 3. He rose again the third day according to the Scriptures (v. 4b). This is the astounding miracle we celebrate here today. Jesus died, but God raised him. This was not a resucitation—a divine CPR—but a resurrection. It was transformation of a corruptible body to an incorruptible, resurrection body. 4. He appeared (vv. 5-8). The risen Jesus appeared to Cephas (Peter); to the twelve; to over 500 brethren; to James and the apostles; and to Paul. II. Paul wants to make clear that the resurrection is central to the Christian faith (vv. 12-19). It is not an optional doctrine. Some apparently, even then, believed they could have a Christianity without the resurrection. Maybe it was too miraculous, too supernatural, too unbelievable. Paul’s key point here, however, is not merely to insist on belief in the resurrection of Jesus himself, but also to stress that because Christ has been raised, believers can look forward to sharing in a general resurrection of the dead at the end of the ages. 1. Christian preaching and faith is empty (v. 14). It has no content or substance. 2. The apostles are liars (v. 15). 3. Christians have no victory over sin (v. 17). We cannot separate the cross from the empty tomb! On the cross Jesus died for our sin; in the resurrection, we are lifted up into the life of God (see Col 3:1 ff). The resurrection is essential to our sanctification. 4. Christians have no hope after death (v. 18). 5. We live only for this life and are to be pitied (v. 19). This leads to nihilism and despair. Again, Paul’s key point is to link the resurrection of Jesus with the future resurrection of humanity. III. Paul wants to make clear that all humanity will experience immortality because of the resurrection (vv. 20-22). In v. 20 Paul calls Jesus the "first fruits." He is the first bloom—the harbinger of Spring time. In vv. 20-21 Paul draws a parallel between Adam and Christ. As sin came by one man and by him death, so resurrection comes to all men by one man. If Adam is the zero-patient, the alpha man, through whom the infection of sin spreads to all men, Jesus is the zero-patient, the alpha man, through whom the infection of life spreads to all men. The resurrection impacts all men—whether they know it or not. Men who do not believe the Bible are infected by sin, whether they know it or not, and they will share in immortality, whether they know it or not. In John 5:28-29 Jesus said, "for the hour is coming in which all who are in their graves will hear His voice and come forth—those who have done good to the resurrection of life, and those who have done evil, to the resurrection of condemnation." This is the final destiny of all men. Will we take part in the resurrection of life or the resurrection of condemnation? I asked earlier: "What preparations have been made for you for life beyond this life?" You will live again—all men will live again. The litmus test for how we spend eternity will be how we have responded to Jesus (Matt 10:32-33; Rev 20:11-15). …making a tomb with 7,000 soldiers of clay. …having children or grandchildren to kindle your memory. …writing a book men will read a thousand years from now. …having your name assigned to a building, to a window in a church, or to an athletic field. …doing funeral pre-planning to make sure you get a good headstone. It is all about trusting in the risen Christ with all you being and yielding to his will in every crevice and corner of your life. The Pulpit: "The Thermopylae of Christendom"
The pulpit has become dishonored. It is esteemed as being of very little worth and of no esteem. Ah, we must always maintain the dignity of the pulpit. I hold that it is the Thermopylae of Christendom. It is here the battle must be fought between right and wrong—not so much with the pen, valuable as that is as an assistant—as with the living voice of earnest men, "contending earnestly for the faith once delivered unto the saints." In some Churches the pulpit is put away, there is a prominent altar but the pulpit is omitted. Now the most prominent thing under the Gospel dispensation is not the altar which belonged to the Jewish dispensation but the pulpit. "We have an Altar, whereof they have no right to eat which serve the tabernacle!" That Altar is Christ but Christ has been pleased to exalt "the foolishness of preaching" to the most prominent position in His house of prayer. We must make sure that we always maintain preaching. It is this that God will bless. It is this that He has promised to crown with success. "Faith comes by hearing and hearing by the Word of God." We must not expect to see great changes nor any great progress of the Gospel until there is greater esteem for the pulpit—more said of it and thought of it. The April 5, 2007 issue of the Religious Herald, Newsjournal for the Baptist General Association of Virginia (BGAV), reported the top 100 churches in per capita missions giving in 2006. Jefferson Park Baptist Church came in at number 10 on the list, out of 1,400 BGAV churches, with missions giving (beyond our own church) at $156.43 per member. Before we pull a muscle reaching around to pat ourselves on the back, we should (a) be thankful that the BGAV counted our SBC giving in this total, since we gave only a very small amount (and that designated) to the BGAV in 2006; and (b) be humbled by remembering that the only reason we got in the top ten is because we actually have a disciplined church membership (i. e., we removed the "inactive" members from our rolls a few years ago to "right-size" the figures on our church). This listing also has irony, because our 2007 mission giving is being channelled through the SBCV. Anyhow, I'm still proud of the fact we landed in the top ten! Props again to Steve Hills for letting me know about this new "easy to read" version of Owen (here's the link). Enjoy! Below is a "Stylos" article I wrote in March 2005, before the blog began. Food for thought this week before Easter. If you confess with your mouth, "Jesus is Lord," and believe in your heart that God raised Him from the dead, you will be saved" (Romans 10:9 HCSB). So let no one judge you in food or in drink, or regarding a festival or a new moon or sabbaths (Colossians 2:16 NKJV). A recent letter to the Editor in the Charlottesville Daily Progress lamented the secularization of "Easter." The store shelves are lined with candy, toy bunnies and chicks, but no crosses, empty tombs, or Bibles. She reported that the puzzled store clerk could not answer her question as to why we celebrate Easter. As with Christmas, therefore, some Christians, in the name of Biblical faithfulness, eschew the "holiday" completely. Indeed, "Easter" is yet another example (alongside Halloween and Christmas) of the success of past Christian missionaries that has perhaps turned around to bite us in these days. Critics are quick to point out that the English word "Easter" itself derives from the Anglo-Saxon goddess of spring (Eostre). The missionaries took pagan holidays and infused them with Christian meaning. Pagans had long marked the coming of spring with a holiday that celebrated the fertility of nature and its annual awakening from winter slumber. Christians saw a natural opportunity to teach the resurrection. In an increasingly post-Christian society, the pagans now seem to be taking back all the things that were once theirs. So, many now have Easter (candy, new clothes, egg hunts), without all the baggage of the cross and the resurrection of Jesus. on Sundays as the Lord’s Day. In a real sense every Sunday is Resurrection (Easter) Sunday. The Biblical pattern establishes the first day of the week as the time for Christians to gather and worship (see John 20:1, 19; Acts 20:7; 1 Cor 16:2; Rev 1:10). Think about it. Jesus was crucified on a Friday. The cross is central to the Gospel. Why then did the church not begin to meet on Fridays to worship? Because to preach the cross alone would mean a truncated gospel. Jesus was not a good teacher who died a horrific martyr’s death and was merely "raised" in the memory of his close friends after his death. No. His dead and lifeless body, by the power of God, came into a transformed, embodied existence. Paul also said that if we do not preach the risen Jesus then "our preaching is empty and your faith is also empty" (1 Cor 15:14). 2. It provides us with a time to focus on the central Christian doctrine of the resurrection of Jesus Christ that is at least approximate to the time of year when that event actually took place. With Christmas, we do not know precisely when Jesus was born. We do know with certainty, however, that Jesus was crucified and raised in the springtime during the annual celebration of the Jewish Passover. One of the early controversies among Christians who lived beyond Bible times concerned when Easter would be celebrated (called by church historians the "Paschal Controversies"). Some argued that it should be celebrated on the actual date when Jesus was raised (Nisan 14 on the Jewish calendar), whatever that particular day might be (Monday, Tuesday, etc.). Others argued it should always be celebrated on a Sunday to recall the actual day on which Jesus was raised. The latter prevailed, so we celebrate Easter on a Sunday. Another controversy was whether Easter should always be observed at the time of the Jewish Passover or by an alternate lunar plan. Again, the latter opinion prevailed. So, in accordance with Christian custom but fully aware there is no Biblical mandate for any such annual observance (again, the only Biblical mandate is weekly worship on the Lord’s Day), we celebrate Easter each year on the first Sunday after the first full moon following the vernal equinox. In so doing, we are assured an annual occasion to concentrate, with some flourish, specifically on the doctrine of the resurrection. We do this in a season approximate to the time when Christ was crucified, buried, and raised. In addition, we may also make strategic evangelistic use of the season to share with non-believers the good deposit of truth concerning Jesus Christ with which we have been entrusted. Is Easter Biblical? Yes and No. Yes, it is always Biblical for believers to gather on the Lord’s Day and remember the resurrection. No, we have no Biblical mandate and are, therefore, under no obligation to make this an annual event. Christians, as always, are to be guided by a Biblically informed and Spirit led conscience as to if and how to participate in Easter. Some do this by avoiding the name "Easter " at all and use the alternative "Resurrection Sunday." Others see no problem with using the more culturally accepted title of "Easter" as long as it is infused with real Christian meaning (i. e., it’s not all about egg hunts and bunnies). In Colossians 2:16, Paul addresses questions such as these that were on the hearts and minds of the believers who were also walking the tight rope of being in the world but not of it: "So let no one judge you in food or in drink, or regarding a festival or a new moon or sabbaths." His words offer appropriate guidance in our age as well.